Keith Woodley meditates on the glorious sight of a fock of Wrybill soaring rhythmically above the Firth of Thames, a poetic vision Miranda birders call ‘a fung scarf’, and being a confrmed ornithologist also ponders on the biological factors that lie behind such spectacular displays. If you are familiar with the natural features of the Pukorokoro Miranda coast and you are remembering your visits here, what is the first image that springs to mind? The shell banks per.haps? 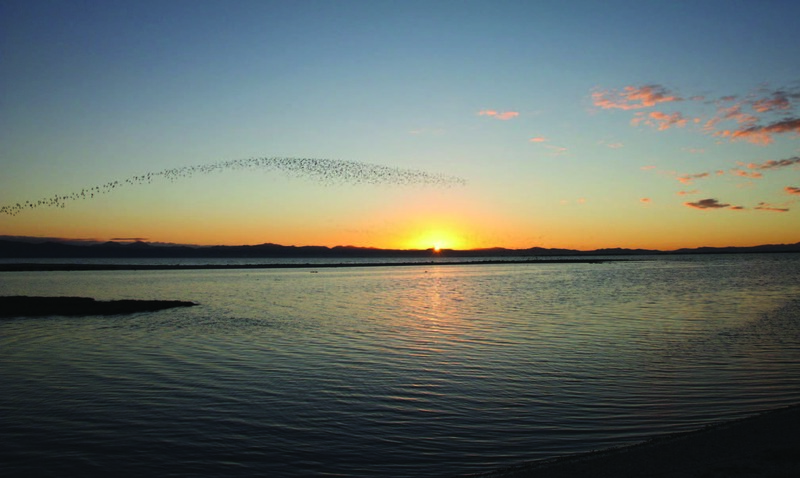 The massed flocks of godwits and what you have learned about their migrations? The broad expanse of the stilt ponds covered in birds? For many I suspect the choice will be the aerobatics of the resident Wry-bill. Some years ago we ran a contest in the Naturalists’ Trust’s magazine for an appropriate collective noun for Wrybill. There were already a charm of Goldfinches, a spring of teal, or an exaltation of larks. Many suggestions were proffered: A rhythm of Wrybill? A wrinkle of Wrybill? A twist of Wrybill? The one we chose was a flung scarf of Wrybill. I was reminded of this in early July by one of our members. Staying two nights at the centre, morning and evening she found herself absorbed to the exclusion of all else by the Wry-bill display. One morning we both watched from the front steps as the flock performed above the mangroves at the Taramaire creek mouth. For nearly an hour they were at it, scrolled across the cloudless morning sky like animated calligraphy. The swirls and scrolls, the undulating ribbon etched darkly against the light parchment, and then the vertical coil in twisting descent, an uncanny impression of a tornado rolling across the American prairies. I have been immensely privileged many times to witness variations of this, but never has it become tired or stale; each time the magic is pure and refreshed. Flock dynamics such as these have exercised many scientific minds over the years. Research into flock flight behaviour has usually focused on one or other of two main questions: how do they do it, and why do they do it? Most bird flocks seem to fall into one of two categories. Line formations are where birds typically fly in staggered, or echelon, formations rather than in straight lines nose-to-tail. The classic example is the V-shape of a flock of geese, where two such lines join at the apex at the front of the formation. Cluster formations usually consist of large numbers of smaller birds such as pigeons or small shorebirds flying in more irregular arrangements that have a strong three-dimensional character. Such groups are defined by synchronized, and what appears to our eyes, to be simultaneous rapid changes in direction. The Taramaire Wrybill that morning were a quintessential example of this. Scientific questions about such behaviour have usually focused on the mechanism: how do birds achieve such synchrony? In 1931 British ornithologist Edmund Selous presented the outcome of his 30 years of meticulous observations of various species of birds flying in organized flocks. He was convinced that within the limits of un.assisted human vision, birds could be seen rising from the ground, or making turns simultaneously, for which there were only two possible explanations. The first was a disturbance from outside the flock, such as the sight of a predator, which would instantaneously alert all birds in the flock, causing them to react in an identical manner. The second possibility was an undefined quality he called ‘thought transference’, or what we might refer to today as ‘telepathy’. FLUNG SCARVES: Two versions of the dance of the Wrybills. In the more modern world of high-speed photography and computer models, the idea of telepathy no longer holds. In the 1980s, computer programmers began to create models that show how simulated animal groups can respond to the movements of individuals within them. They found three simple rules were sufficient to form tightly cohesive groups: each animal needs to avoid colliding with its immediate neighbours; it needs to be generally attracted to others of its kind, and it has to move in the same direction as the rest of the group. These factors can be used to develop a computer model to create virtual flocks. However, such models cannot adequately explain how bird flocks can react as quickly as they do. Films of Dunlin flocks in the US were analysed frame by frame to show how each individual bird moved. This revealed that a turn ripples through a flock much as a Mexican Wave passes through sports fans at a stadium, a finding the researcher called the ‘chorus line hypothesis’. An individual dancer who waits for her immediate neighbour to move before initiating her kick will be too slow; similarly, a Dunlin watches a number of birds around it, not just its nearest neighbours, for cues. But the wave was propagating through the flock at least three times faster than could be explained if they were just watching their immediate neighbours. Studies of European Starling flocks, which also perform elaborate flight displays, expanded on these findings. It was found that however dense a flock appears from the outside, its members are not evenly distributed. Rather, each member has a good deal of space behind and in front. Starlings don’t appear to mind having neighbours nearby beside, or above and below, as long as they have open space ahead. The presence of a clear path in the direction of travel minimizes the likelihood of collisions should the birds need to shift their course suddenly, such as when a falcon attacks. But researchers were also able to quantify the chorus line hypothesis. By looking at correlations between the movements of neighbouring starlings, they found that each bird always pays attention to the same number of neighbours, whether they’re closer or farther away. Somewhere between 2 and 6 neighbours seems to be the optimal number for making these decisions. But why do they do it? What is the biological utility of such flight behaviour? The most commonly accepted view is that the closely spaced cluster flocks offer protection against aerial predators. It is thought that a predator may be confused by this multi-target scenario or even deterred by the increased risk of collision. This is quite an acceptable explanation although it does not explain the Wrybill behaviour over Taramaire. Nor does it explain the extraordinary behaviour of Starlings. In Europe, towards sunset flocks of Starlings that have been widely dispersed by day gather into huge flocks over a nighttime roost. There they perform spectacular and prolonged displays for up to an hour. What is the purpose of this? Is it not a waste of energy? Does such a visible display not attract the attention of predators? No adequate answers have yet emerged. So what about those Wrybill? Versions of this display can be seen anytime from January to early August, but it is late June or early July when it seems to be at its most intense and prolonged. After that our Wrybill drift off to the South Island and dispersed to breeding sites. 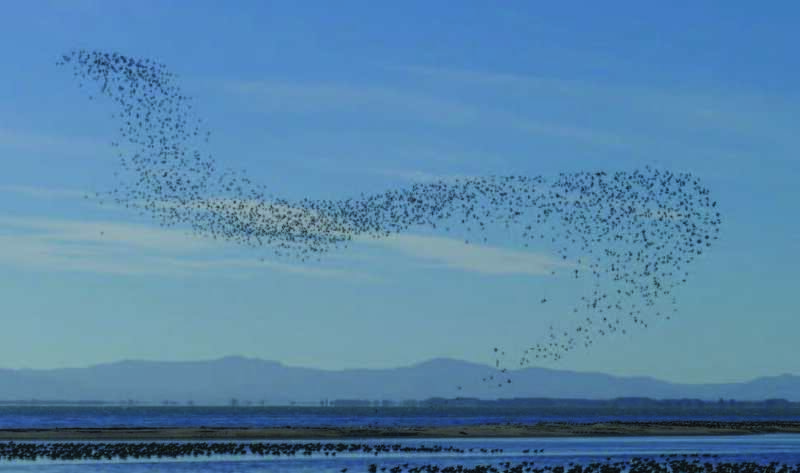 Those 2000 birds from Taramaire transform into individual pairs scattered over hundreds of sq km of braided riverbeds. So was that aerial performance some form of pre-dispersal display? Or was it just recreation? Was it just that they were doing it because they could, for the sheer exhilaration of it all? For the biologist this may not be acceptable, but that is the conclusion we both reached on the front steps of the centre that morning.